Learn 5 concrete ways to generate awareness and raise more money from your #GivingTuesday 2018 and year-end giving campaigns. Are you ready to maximize the final fundraising push of the year? Just a few weeks remain until one of the biggest fundraising days of the year: Giving Tuesday 2018. Often stylized as #GivingTuesday, the day encourages people to take a break from holiday shopping and set aside the Tuesday after Thanksgiving to support favorite causes instead. Since 2012, this special day has been widely considered the kickoff to year-end giving season; 2018 is projected to bring in the most funds yet. Do you have plans for your #GivingTuesday campaign in place? 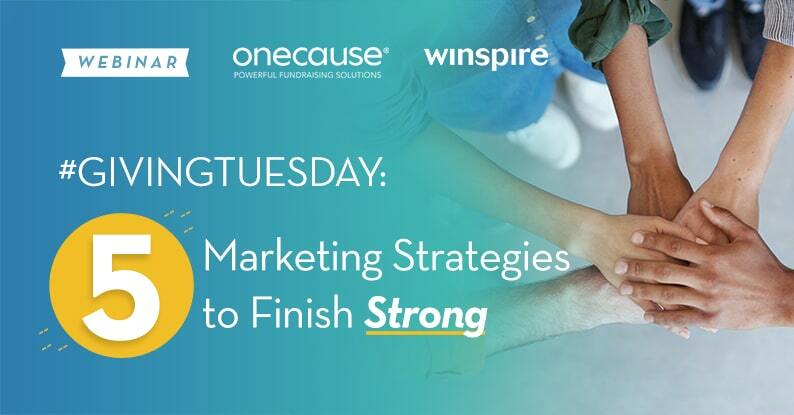 OneCause is teaming up with Ian Lauth from Winspire to explore the top 5 marketing strategies for effective year-end giving campaigns. Learn how to tell the story of your organization, engage donors on social media, maximize email campaigns and more to finish this fundraising season strong.